Today, the Nature Coast Landings RV Resort Association, Incorporated, is a privately owned resort boasting 239 individually owned lots, two community buildings, a private laundry, propane services and several other amenities. Amenities include high speed fiber optic service (FIOS) to each lot, a screened in and heated swimming pool, fitness center, dog run, bocce ball court, game room, two community use kitchens, bathrooms with shower facilitates in both clubhouse buildings and many organized activities. Nature Coast Landings history begins when the site plan permit was issued in March 1998 and the clubhouse building permit in October 1999. Initially there were three Associations to the park, the Master Association, the Storage Association, and the Campground Association. The Resort Association officially incorporated September 18, 2003 and the original three associations merged into the one Resort Association and is how NCL is organized still today. On October 31, 2008 the Resort opened the current expanded laundry room and the certificate of occupancy was issued for Friendship Hall on November 3, 2008. On July 18, 2011 the NCL Board of Directors voted to accept the original developer's settlement proposal and gained complete control of the resort. Nature Coast Landings RV Resort Association, Incorporated, is a cooperative property which is defined as a multi-unit residential development where each resident has ownership in the entire development by virtue of a share or certificate in the corporation that owns the development. The resident has the right to occupy a particular unit by virtue of a lease between the owner and the corporation. 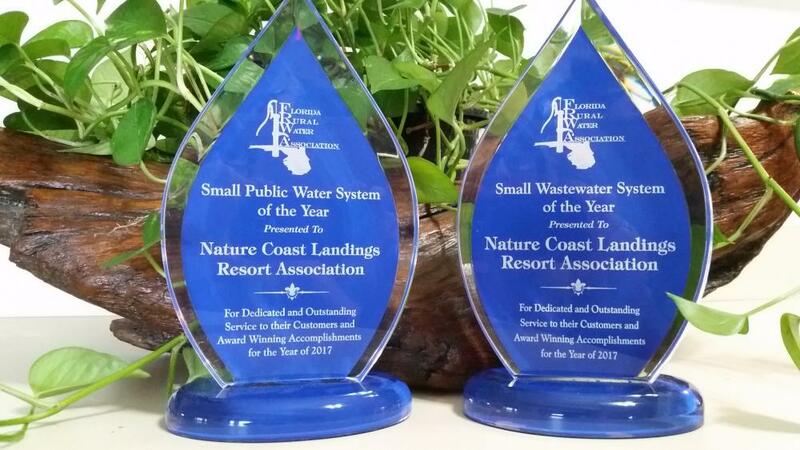 Nature Coast Landings RV Resort was awarded the Florida Rural Water Association (FRWA) for Small Public Water System of the year (2017) and Small Wastewater System of the year (2017). These awards are something to be very proud of. The small category is for systems up to 3000 users. We were the only recipient in the state of Florida to receive two awards.